City officials spent much of their two-hour annual sit-down with L.A. County Supervisor Kathryn Barger on Wednesday discussing a local priority: How to fund the construction of additional sound walls to help block out freeway noise in the city. La Cañada Flintridge is hoping the county can help it cover the $7 million required to take advantage of $5 million in Senate Bill 1 money that was procured by state Sen. Anthony Portantino, an LCF resident, through a local partnership program under the transportation funding bill, which increased gas and vehicle tax rates. The funds would allow the city to pay for four sound walls. As a result, the city must identify $7 million ($2 million for design and $5 million for construction) to match the $5 million being offered by the state. Because LCF doesn’t have general fund money to dedicate to the project, city officials are exploring alternatives, Alexander said. One idea was to take an advance on Measure M transportation funding, but that would “take us out about 10 to 12 years,” Alexander explained. “Council members had a little apprehension about that because it’s committing 100% of Measure M for that long of a period of time on just the sound-wall project, when there are other projects the city could be constructing that would benefit a wider portion of the community,” Alexander said. With Barger at the table, Division Manager Ann Wilson asked whether the city ought to receive funds from the 710 Freeway transportation system management/traffic demand management alternative approved by the Metropolitan Transportation Authority board in May 2017. The answer from Barger and her team: probably not. But the supervisor suggested that she could help LCF find a different sound-wall funding source related to Caltrans’ sale of homes along the 710 Freeway corridor. “This is something that Anthony and I have had conversations about, even at the Fourth of July, at a parade, he cornered me and we talked about this,” Barger said. “Anthony was successful in getting Caltrans to commit matching dollars, so the money is there from that side, and now we’ve got to be creative and look at how we free it up. LCF officials and Barger’s team also discussed the notion that SB-1 money might be overturned after a statewide vote in November on whether to repeal it. “The polling is not looking good,” said Barger, noting that voters in San Bernardino and Riverside counties are indicating they’re prepared to vote it down now. “From a city standpoint, you cannot campaign for something … but you can share how [you] have used the funds and how [you’re] planning to and let the voters decide,” she said. If SB-1 stands, it would deliver $350,000 to LCF; without it, the city will get $115,000 before the tax is repealed. 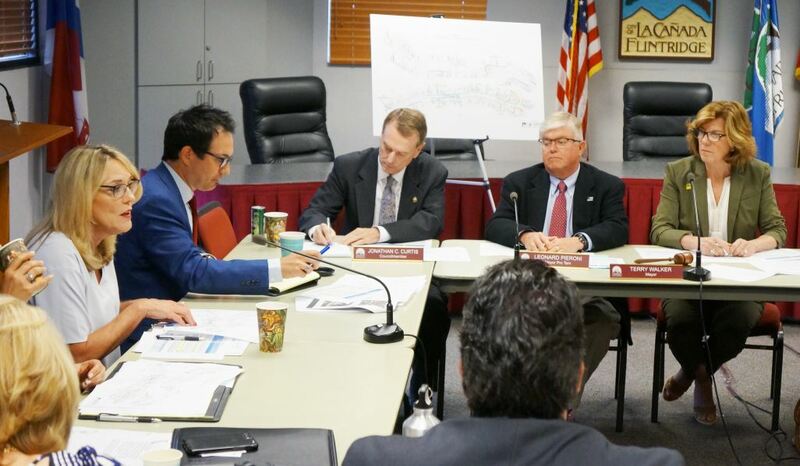 LCF officials also asked whether Barger could help them swap one of the proposed sound walls (half of which would stand in Pasadena) for another that would be situated entirely in LCF. She seemed open to discussing the change and suggested city officials join her and Portantino for further discussion on the issue. Barger and her team also discussed the L.A. County Safe Clean Water Program, which would levy a tax of 2.5 cents per square foot of “impermeable space” on private property. 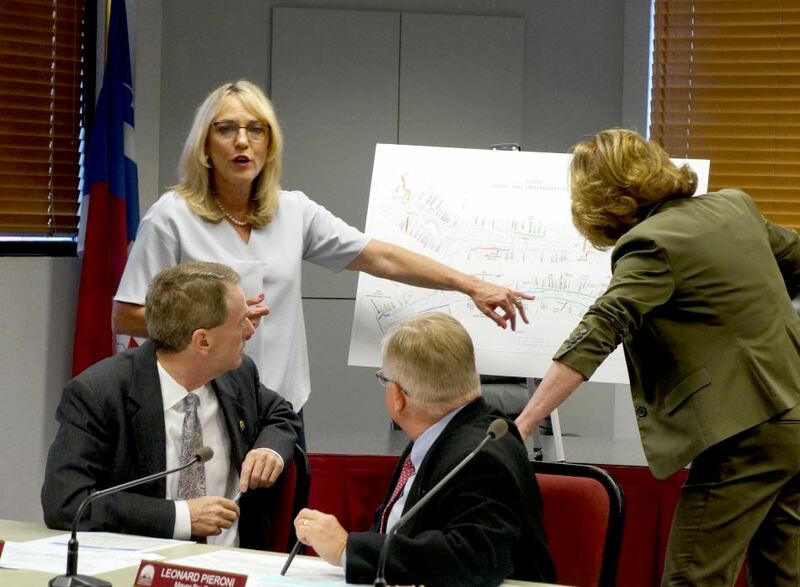 Barger cast the lone dissenting vote on the measure Tuesday, because she said it failed to prioritize storm water discharge in a fiscally responsible way. On Wednesday, she also chatted with LCF officials about beautifying the front of Descanso Gardens, which the county owns, and dedicating funds to share in the cost of street repairs on portions of the road that leads to the popular botanical gardens. There was talk about the ongoing quest to find funding to repair the Flint Canyon Trail, which is steadily eroding and threatening to disrupt LCF’s 12-mile loop of hiking trails. The supervisor’s staff also expressed interest in holding another trail ride in LCF, possibly next year, and Barger accepted an invitation to join Mayor Terry Walker and other community members at the third annual mayor’s hike, scheduled to start at 11 a.m. Nov. 3 at the Flintridge Riding Club.